All of you know I am a huge fan of Amy Harmon, have been a big supporter of her stirring, emotional, unforgettable stories. 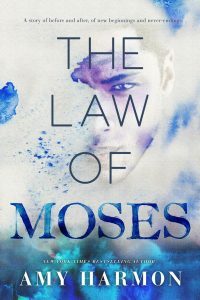 Every book I’ve read of hers lingers long after I’m done and The Law of Moses is the next novel that promises to grip us with its beauty and power. It’s coming November 27th and you can pre-order it now for $2.99, a special limited-time price that will go up to $4.95 after release. I’m also honored to share with you an exclusive, never-before-seen excerpt from this poignant story. Georgia nodded. She knew. Everybody did. Georgia laughed and I felt the air lodge in my throat. Her laugh was throaty and soft, and it made my heart swell like a balloon in my chest, fuller and fuller until I had to sneak breaths around its increased size. “So you liked the pictures?” Georgia prodded after I stayed frozen and silent too long. “The anguish?” Georgie’s voice rose in question. Georgie’s gaze touched on my face like a whisper and drifted away almost immediately, drawn to my tracing fingers. “Have you ever seen the face of the Pieta?” I wanted her eyes on me again and I got what I wanted. “What’s the Pieta?” she asked. “It’s a sculpture by Michelangelo. A sculpture of Mary holding Jesus. Her son. After he died,” I paused, wondering why I was telling her this. I seriously doubted she cared. But I found myself continuing anyway. “Her face, Mary’s face…it’s so beautiful. So peaceful. I don’t like the rest of the sculpture as much. But Mary’s face is exquisite. When I can’t take the stuff in my head I think about her face. And I fill my mind with other things too. I think about the color and light of a Manet, the details of a Vermeer—Vermeer includes the tiniest things in his paintings, little cracks in the walls, a stain on a collar, a single nail, and there is such beauty in those little things, in the perfect ordinariness of them. I think about those things and I push out the images I can’t control, the things I don’t want to see, but am forced to see…all the time.” I stopped talking. I was almost panting. My mouth felt strange, numb, like I’d surpassed my daily word limit and my lips and tongue were weak from overuse. I didn’t remember the last time I’d talked so much all at once. “The perfect ordinariness…” Georgia breathed, and she lifted her hand and followed the wet path my finger made, as if she too could paint. Then she looked at me solemnly. Her brown eyes looked black in the shadowed light, the same color as the water we were immersed in, and I reached blindly for something to hold onto, something to keep me from falling into them. Georgia’s right hand was still pressed to the wall beside mine, and I found myself tracing her fingers, like a child traces their hand with a crayon, up and down and around until I paused at the base of her thumb. And then I continued on, letting my fingers dance up her arm, feather light, until I reached her shoulder. I traced the fine bones at her collar as my fingers glided to the opposite side and back down her other arm. When I found her fingers, I slid mine in-between, interlocking them tightly. I waited for her to lean in, to press her mouth to mine, to lead, as she was prone to do. But she stayed still, holding my hand beneath the surface of the water, watching me. And I gave in. Anxiously. Her lips were wet and cool against mine, and I imagine mine felt the same. But the heat inside her mouth welcomed me like a warm embrace, and I sank into the softness with a sigh that would have embarrassed me had she not matched it with one of her own.